Judy (Maureen O’Hara) wants nothing more than to become a “serious” ballerina, but finds herself hustling a living in burlesques alongside her outrageous, money-grubbing friend Bubbles (Lucille Ball). As Peary notes, this “fascinating” early feminist film — in addition to being an enjoyable “backstage musical” — is noteworthy for being helmed by Dorothy Arzner, virtually the only female director in Hollywood during the thirties and forties. The story remains true to Arzner’s feminist loyalties: while men are clearly the ones with the most power here, the females in the film do what they can to look out for each other and follow their dreams. They are “intelligent, witty, courageous, resilient, self-motivated, self-reliant, honorable, and ambitious” — and, most unusually for the time, are willing to put career first, over romance. 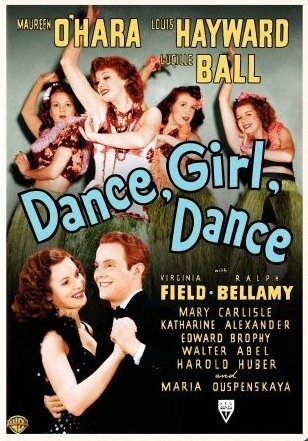 Dance, Girl, Dance is also notable for giving Lucille Ball one of her best early roles. Yes, as Arzner’s best film, and for the memorable performances by both O’Hara and Ball. Discussed at length in Peary’s Cult Movies (1981). One has to suspend slight disbelief occasionally: O’Hara pleading for herself and *all* of her friends to be hired as dancers, just because they work hard and have had bad luck (did that ever fly in New York? ); Ball would not be running a hit show month after month with just the same two routines (or so it seems); would O’Hara really carry that stuffed animal around with her from place to place the way she does? But…with a film as entertaining as this, you just have to pay no attention to a few quibbles. All told, a good show.